You are currently browsing the tag archive for the ‘Goa’ tag. Some three weeks ago we had our long weekend. This weekend truly symbolizes how vast and diverse India is especially after reading and hearing about all the picturesque places the students have gone to. Below are a few descriptions of some of the many destinations written by various students. – Renting a houseboat in Kerala, what is there to say? You rent a sort of floating house that somewhat resembles a boat for a couple of days. And who did this? There were 13 of us, spread over 4 compartments of the finest sleeper seats the indian railways could offer. Our trip from Chennai, the home of glorious malls, to Alleppey/Alappuzha, the home of floating homes, lasted a mere 14 hours and we naturally decided to head straight to the Indian Coffee House, a communist chain of coffeeshops which are owned by the employees and offer cheap eats and swedish tasting coffee. The next thing to do seemed to be to rent the above mentioned houseboat, thus we went with the first and best hustler to the harbor were hundreds of boats were docked. The average houseboat seemed to have at least 2-4 bedrooms with adjourning toilets, a sun deck, dinner area, maybe air condition and of course your very own chef, captain and machine master. As always we were prepared to bargain our asses of, but with a starting price of a mere 1000 rupees per head per night it was hard not to jump onboard the first and best boat with megaphones and the whole sjabang. We managed to resist the urge, instead we boarded a slightly more cockroachy boat were the crew offered bonfires and guitars. After filling the frigde/icebox with beer, rum and other loot we set sails for the backwaters of Indias most literate state. Life at sea mostly consisted of playing cards, guessing names on pieces of paper on foreheads and enjoying the many kingfishers that bless the backwaters with their presence. There were also a few birds. To make the trip a bit more cultural we visited a fish marked, crabs and prawns in a box, and a church, a church. There were also the bonfire where we danced the macarena, sang songs of coffee and awkwardly learned to play drums. After two days and two days the boat threw down anchor were we started (and passed by at least a few times) and the remainder of the day was spend drinking pinko coffee, eating tomato omelets and dividing bills. The trip home on the Alleppey-Chennai Express proved to be something of an experience, as it included being kicked off the train, sleeping among more cockroaches, taking a few busses and missing out on the magnificent malls of Chennai. – For the long weekend a group of us decided to go to Ooty for two days and spend the rest in Bangalore- the shopper’s paradise. A long journey became all the longer because we were mostly travelling nights- turning our 4 day weekend into a seemingly 6 days one :D, all worth it in the end! The first thing we did in Bangalore was meet Sudha, the lecturer for the Peace and Conflict group in her amazing apartment. Set among tall buildings and equally tall pine trees, it was a cool oasis, quite literally! After an amazing breakfast and conversation, we left to explore Bangalore feeling exceptionally well welcomed to the city. The main reason sane people like us go to Bangalore is to shop- so no surprises that our first stop was Shopper’s Stop! Afterwards, laden with stuff that we would or would not use in the future, we went to meet some friends who were based in the city and used that as an excuse to try a variety of food (spicy of course). Then came the part that I was looking forward to the most- meeting my cousin (whom I hadn’t seen for three years)! Most of the two days in the city were spent cooking traditional Nepali food and experimenting (hacking off my hair for instance, and buying a bean bag). However, in between bites, we explored Commercial Street as well as other shopping areas around. Those places are famous for ethnic wear, accessories, beauty products, international brands, shoes, furniture or I can just sum up and say everything you might want under the sun (except happiness that money supposedly cannot buy :D) When one is in Bangalore, you cannot help but notice how small the buildings make you feel. Coming back from Bangalore was a race against time- because we needed to catch a bus back but were stuck in a traffic jam for an hour! Thanks to the warnings of friends we had left a little early, so despite everything, we did make it on time! To sum up the Bangalore journey- to me it was all about the people I love, hospitality of people I had no reason to expect it from, amazing food, tall buildings and amazing prices. – The first stroke of thought that crossed my mind when getting of the plane in Goa was the cool air compared to back in Pondicherry. When out of the airport we, the 6 girls from Raj Maison, sat down on the sidewalk and discussed if we were to go to Palolem, a city in the south with yoga and bonfires, or Arambol, up in the north with Goa’s most beautiful beach (according to Lonely Planet) and more of a partyscene. We decided on Arambol. 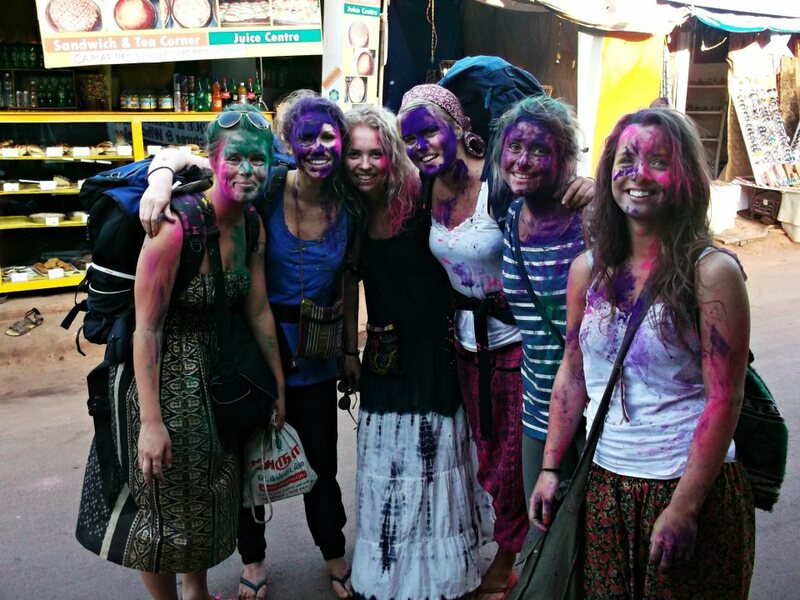 The first thing that happened when we got out of the taxi in Arambol and started our search for cozy beachhuts, was that we were attacked by happy Holi-celebraters and got all covered in different colours. And so we walked the rest of the evening covered in these colors and enjoying all the «happy Holi!»-greetings we got. Arambol was really an amazing place to forget about reality. The beach lived up to its reputation, with kilometers of white sand, pittoresque little fishingboats that would provide all the beachresturants with fresh seafood, palmtrees, colorful houses and beachhuts that cost almost nothing to rent, and perfect waves. We spent everyday first eating breakfast on 21 coconuts (the best breakfast resturant where we soon were well-known) and then just laying and enjoying that amazing beach. 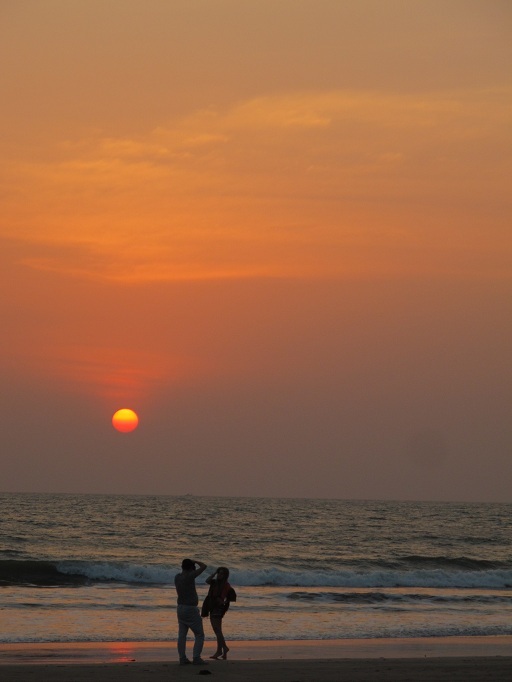 Goa is really a tourist place. Unlike the rest of India you can walk around in singlets and short shorts, and the streets are lined with tourist shops that all sell about the same thing. At night we’d have dinner on one of the resturants on the beach, with our feet in the sand, candles on the table and the stars above us. Afterwards there were several nice bars and clubs to discover, and we met a lot of other tourists to mingle with. On saturday night we went to a huge Night Market in a city halv an hour away and afterwards we went to an even bigger club called Club Cubana were we could dance the ants out of our feet and afterwards take a dip in one of the pools if we felt like it. The lazy sunday-evening that followed we found a resturant that showed «The Beach» and «American Gansgter» which felt like the perfect way to spend that evening. 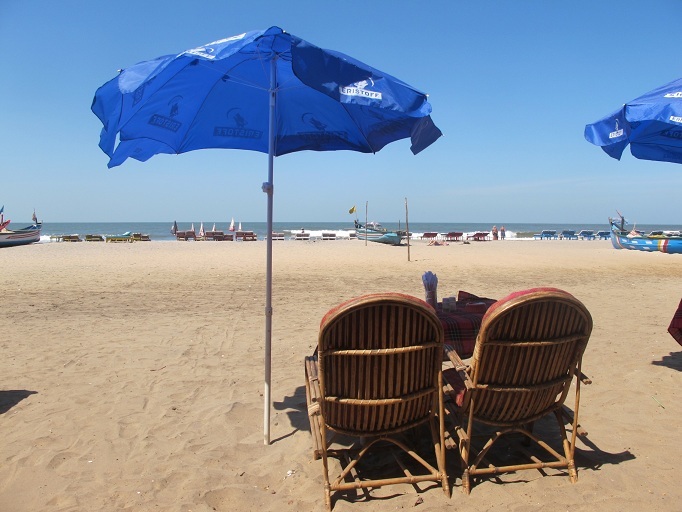 We went back to Pondicherry on a tired tuesday and we all felt completely content with our long week-end, we wouldn’t have wanted it neither shorter nor longer. Men under disse forutsetningene begynte vi altså å planlegge, noe som fort resulterte i reiseruten New Delhi – Jaipur – Agra – New Delhi. Ettersom vi lever i indisk tid, var det ingen overraskelse at flyet fra Chennai til New Delhi var forsinket. Dette resulterte bare i at vi gikk inn i kvinnedagen med en nattkaffe på flyplassen i Delhi, etterfulgt av en natt på teppegulvet. Tidlig følgende morgen tok vi flyet til Jaipur. Jaipur viste seg å være en by som bydde på alt. Den gamle bydelen, bedre kjent som «the pink city», var fylt med mennesker, farger, lukter og søppel i de trange gatene, mens den nye byen bydde på renhet, store bygg og fine veier – ikke fult så mye folk. I tillegg til alt som måtte ses i den todelte byen ( for eksempel Jantar Mantar- astronomiskeinstrumenter fra 1700-tallet, eller Hawa Mahal – et bygg der vinduer ble konstruert for å kunne spionere ned på gata) finnes det også store fort rundt byen. Vi besøkte amber fort, og dette ble en storslott opplevelse på alle mulige måter – delvis fordi vi ikke hadde store forventninger til det, og delvis fordi det rett og slett var et fantastisk bygg der det strakte seg over fjellet. Som du skjønner var to dager alt for lite for å oppleve denne byen, spesielt med tanke på at den ene dagen var holi (fargefestivalen som Karsten snakket om i sitt forrige innlegg). Holi dagen ble feiret på et statlig arrangement med musikk, dans, latter og selvfølgelig en masse farger. Resten av dagen ble brukt inne på hotellet; vestlige jenter i en ukjent by under en festival er ikke det lureste. Neste opplevelse kom i Agra. Målet her var å få med oss Taj Mahal, noe som resulterte i at vi 05:30 stod klare foran billettluken. Igjen merket vi den Indiske tiden ettersom vi slapp inn en time senere, og fikk oppleve (siste del) av soloppganga. Når vi kom oss igjennom sikkerhetskontrollen og forbi en bråkete apekatt, gikk vi igjennom en slags triumfbue – og midt i buen fikk vi se det vi var kommet for; Taj Mahal. Det var umulig å ta øynene fra det hvite mesterverket. Det var ikke bare størrelsen på bygget, men også arkitekturen med dets flotte detaljer som overrumplet oss. På dette stedet var vi typiske turister, og der fulgte også typiske turistbilder . Vi fikk også her oppleve mange flotte indere som med sin gebrokken-indiske engelsk spurte «Can we take a picture with you?». Den eneste måten (som det senere viste seg) for å få dem til å gi seg, var å svare «Ok, hundred rupees!». Men så mye var vi altså ikke verdt! India setter også satt sitt preg på magen, noe som laget en liten krise på Taj Mahal. Krisen var selvfølgelig til stor latter for oss alle, med det faktum at ei spurta over hele Taj Mahal plassen for så å bønnfale toalettvakten om å slippe inn uten å betale (man tenker ikke på penger når det er krise!). Hun rakk frem i tide, men det var helt klart tidenes mest komiske situasjon. Etter den magiske opplevelsen etter Taj Mahal, dro vi videre til Delhi. Vi fant et hotell midt på grensen mellom New og Old Delhi, og hadde dermed god tilgang til begge sider. Det lå rett med togstasjonen og den største bazaren, så var superfornøyd med stedet, ser man bort fra kakerlakkene. Den første dagen så vi Delhi-fortet med sine nydelige bygninger inne på selve plassen, og deilige grøntområder vi kunne sitte på. «Ok, hundred rupees!» ble brukt flittig her også. Det som er fint med en slik kommentar er at både oss og dem som ønsker bildet bare begynner å le, derfor skaper det bare morsomme situasjoner istedet for irritasjon. Etter den ekstremt varme turen på fortet var vi klare for mat. Vi er alle blitt glad i både masala, nan-brød, gobi osv, men når man har vært i India i to måneder og man tilfeldgivs kommer forbi en McDonalds – da går man inn. Etter vi hadde fylt opp magen til bristepunktet med kyllingburger (de har selvfølgelig ikke kjøtt som inneholder den hellige kua), var neste serverdighet på menyen: Indias største moske. Etter den hektiske og varme dagen endte vi opp på kino, en skikkelig bollywood film. Det var en fantastisk opplevelse selv om vi ikke skjønte hva de sa (filmen var på hindi, uten undertekst). Jeg begynner å forstå at man faktisk kan finne ut ganske mye av å bare se en film. Morgenen etterpå var vi tidlig oppe. Denne dagen skulle vi hjem, men vi hadde et par ønsker før det. Vi kjørte i en halvtime på hovedveien igjennom byen (denne byen er stor!) til et lotusformet tempel. Her slapp vi dessverre ikke inn – vet ikke hvorfor det var stengt. Videre ble vi kjørt til en grav (jeg husker dessverre ikke navnet) som i arkitekturen egentlig lignet litt på Taj Mahal – bare litt mindte, i en annen farge og et helt annet mønster. Vi fikk med oss Indiagate (en slags triumfbue til ære for falne soldater) før vi dro tilbake til hotellet. Etter en rask tur på hovedbazaren og en time i taxi var vi på flyplassen igjen. Denne gangen var det ikke indisk tid, så det ble løping frem til gaten. Det tar lang tid å fordøye en slik tur med både opplevelser, reising og krisesituasjoner. Vi sitter alle igjen med glede, flere venner, nye kunnskaper og en del latter. India er magisk. Multikulturelt og mangfoldig. Jeg kunne bodd i India i ti år, og enda ikke fått med meg alt jeg ønsket. Uansett så får jeg begynne i det små – og det burde du også gjøre. Hei Norge. Nå har jeg lakket neglene, ladet kameraet og pakket veska. Om en alt for lang time, reiser jeg, Ane og Carina til Goa. Vi skal på en rundtur rundt i landsdelen, og planlegger å male den like rosa som neglene mine. Vi skal hoppe i fallskjerm, bade i havet, og kanskje lukte litt på ølen der borte. Tjohei!